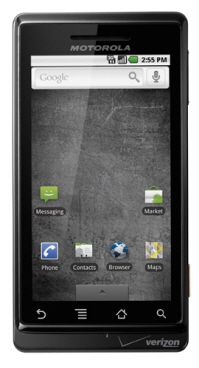 Verizon released more information about the Motorola Droid on Wednesday. Here are the five most interesting details. Verizon has set the price of the Droid at $199, the same price as the 16GB iPhone (the 32GB iPhone costs $299). The Droid comes with a 16GB memory card. But the user can pop that out and upgrade to 32GB themselves, if they choose. Droid has an HTML5 Webkit browser, compared to HTML4.1 on the iPhone and the Pre. The Droid features an 854x480 screen — compared to 480x320 on the iPhone — and so the screen will show about twice as many pixels as the iPhone (of course it will be much smaller on the screen). 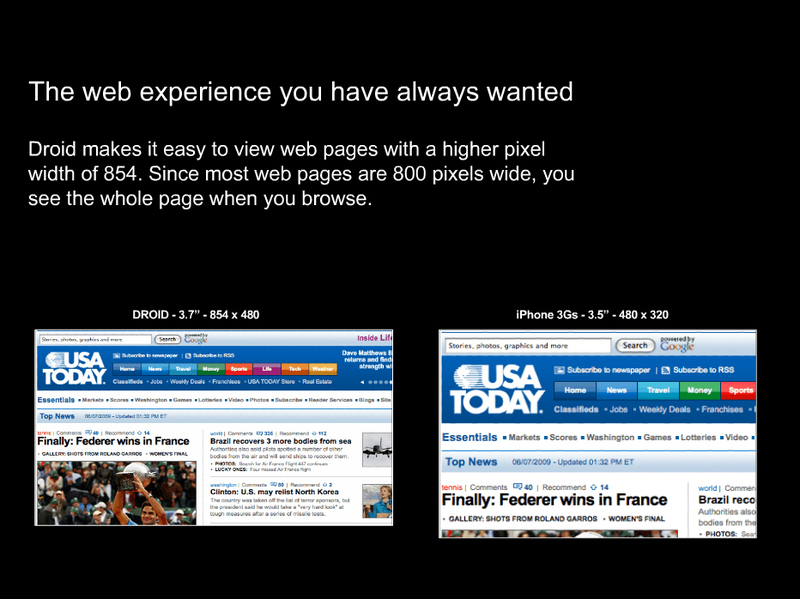 The image below (a slide from Haller's presentation) shows how much more of a Web page you'll be able to see on the Droid versus the iPhone. Verizon officially revealed that the Droid will have built-in support for Microsoft Exchange messaging, including push capability for email, calendars, and contacts. Since it's still mostly business people that are buying smartphones, this is critical — and it was missing from the G1, the first Android smartphone. Another feature that Verizon touted was Google-powered voice search. Haller described the Droid as a "true search monster." He said, "One button, talk to the phone and you'll find what you're looking for... The voice service works very well." Verizon's ad campaign for Droid has almost exclusively been aimed at the iPhone (and Halller confirmed that more ads are coming), but that doesn't mean that the door is closed on the iPhone coming to Verizon. Haller said, "We continue to talk to more manufacturers, including Apple. We'd love to have to the iPhone." Verizon won't load a bunch of its own software on the Droid. "The only thing we're going to load on here is visual voicemail." The hi-res screen will do "DVD-quality video"
Haller called it the "thinnest qwerty slider in the world"
Verizon does not expect to have any capacity problems like AT&T has seen with the iPhone. "We've literally spent millions of dollars nationwide to increase our capacity," said Haller. "We've put ourselves in a very favorable position for data capacity." Later on Wednesday at the press kick-off event in New York, I got a live demo of the Droid and I received a review unit from Verizon. My personal observations and a full review of the Droid will be forthcoming.